Shwekey is back! and has delivered us with an album of 13, yes, that’s right, 13 songs! 12 new and one older one re-recorded and remastered. Once again, I will use the HOT/MILD/COLD system for my take on the songs. Areivim – (HOT) Shwekey is back! This Yitzy Waldner composition is just the thing to get you back on your feet. The mix of quality arrangements and Shwekey’s ridiculously high range is sure to get the blood flowing again! My favorite part is his transition from the refrain to the chorus when he says “oy BaTorah!”. Listen for it a few times during the course of the track. My one issue with this song is it could have used about four less “Zeh klal gadol batorah” parts. The song is dragged on a bit. And by the way, 4:30 until 4:51 is “Shwekey gadlus”. Tshuva– (MILD) The multi-talented master composer Yossi Green lends a hand with his composition and vocals in this first traditional slow song on the new album. Truth be told, I’ve heard way better Yossi Green songs. It’s very repetitive and would have been a bore if anyone but Shwekey sung it. It definitely has heart in it, but it’s barely beating. Bold words, I know. But after listening to this song multiple times, it’s still not giving me a g’shmak. Veshochanti – (HOT) Wow! What an amazing introduction to this song! This is a song that Shwekey should be opening his concerts with. I wouldn’t be surprised if we see just that. My question is, how many times can you say the word “Nu” in a song? If anyone wants to count it up and post it in a comment that would be so great and pretty funny! :) Back to the song: There’s no intricate pattern to the way this song is handled, it’s just a good song to get the crowd on its feet. Ovinu – (MILD) This song is composed by someone I’ve never heard of: Shimon Swiatycki. It’s chorus has the familiar words “Ein Od”. Hold on a second, did Shwekey think he could pull a fast one on us? He just used these very words in “Ki Hashem” from his most recent album. That song was through the roof in goodness. So when I compare this new song to “Ki Hashem” it doesn’t quite rack up. However, Shwekey hit’s some serious notes in this song (4:31). Ad Bli Dai – (HOT) Another Waldner song and the title track of this album. The intro feels like I’m listening to a broadway play (not that I’ve been to any of those, of course :P). The refrain is catchy and the chorus is even juicier! You can expect to hear these songs during second dance at a chassuna near you! Illon – (MILD) A Yochanan Shapiro composition! Who is he? A member of the Acheinu group and composer of Shwekey’s famous “Im Eshkacheich” from his “Yedid” album. The beauty of this song is its sing-ability. That’s something you can’t usually say about Shwekey songs. They are usually out of a normal persons range, but this song is a good song for all. Shwekey, of course, takes it to the next level and goes on keys higher than need be. However, he does make the song better with the keys he chose. Menagen – (COLD) Classic Freilach. Enough said. Tzadikim – (HOT) This song is filled with hartz. 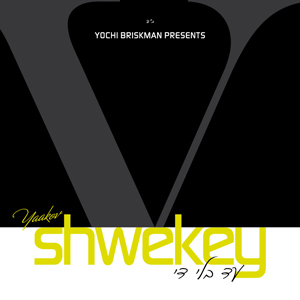 For a style comparison, think “B’soh” from Shwekey’s “Yedid” album. In other words, it’s “Shwekey Chazzunos”. The lyrics are about the reason why Moshe Rabbeinu’s gravesite was hidden from mankind. The reason is, if we were to find it and daven there, Moshe would arise and daven for us and it would end our golus. Why? Because the powers of a tzadik in shamayim is greater than when he was on earth. However, we still beg or tzadikim who have passed on to answer our pleas and daven for our redemption. I wrote a summary of the meaning of this song, because it makes the song all the more greater when you understand it. Asher Boro – (HOT) The intro to this song is almost the same as “Ad Bli Dai”. Think “Hiney” from Shwekey 2 when you hear this song. However, what makes this song better than “Hiney” is the middle part of the song (Siman Tov U Mazel Tov). Listen to this part to get your heat pumping. A great song for the treadmill! Start out at a normal pace and then go faster by the middle and slow down again for the high. I’m JMDerech and I approve this message. Music of Forever – (MILDLY HOT) An English song! It’s no “Shema”, “Tatte” or “Mamma Rochel” but it has it’s good parts, er, part. I like the song from 4:21 until the end. This part of the song is pure gadlus. Listen to the notes that Shwekey hits. Especially when he says “Lasts” at 5:01. Then “heart” at 5:14 and “forever” at 5:26. Vehi Sheomdoh – (HOT) Everyone’s favorite song from “Shwekey in Cesaria” is back and redone without Razel’s vocals and the crowd in the background. In my opinon, this version is way better than the concert version. This is a must buy for all Shwekey fans and Jewish Music fans in general. It’s definitely not his best album. For me, that was “Yedid”. However, it’s Shwekey people. How can you not buy an album from the best voice in Jewish music? He can make any song sound good. It’s a gift of his and baruch Hashem we have the ability to listen to it on CD and MP3. GO BUY IT NOW BY CLICKING HERE!